Stunning natural scenery, soothing hot springs, adventure activities and incredible food. 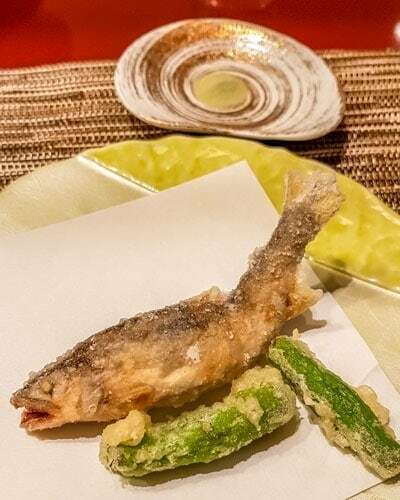 Kinugawa Onsen makes a perfect weekend break for locals and a Japanese onsen ryokan experience is a fabulous inclusion in your Japan itinerary. Kinugawa Onsen is a hot spring town in Nikko, Tochigi prefecture. It’s a popular tourist destination and being close to Tokyo it makes an ideal day trip or weekend getaway from the city. You can get to Kinugawa Onsen in 2 hours 10 minutes from Asakusa station in Tokyo with Tobu Railways. A single ticket will cost Y 2990 but if you’re staying a night or two take a look at the Tobu Nikko All Areas Pass for Y 4520. The All Areas pass includes the return tickets to Tokyo, train tickets within the Nikko area, buses, a lake cruise and the ropeway. You will also need to purchase the supplement ticket to travel on the express trains on the Tokyo portion which will be around Y 2880 for the return trip. 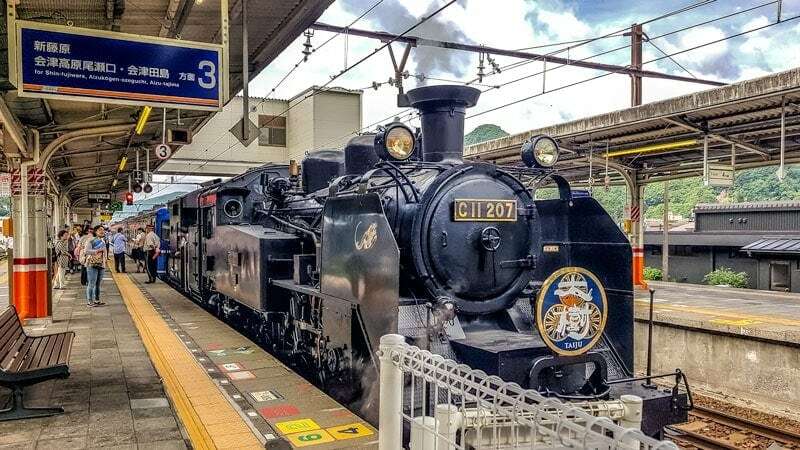 If you’re a train buff or love the nostalgia of an old steam train you can take the ride out from Shimoimaichi Station to Kinugawa Onsen on the SL Taiju. The trip takes around 35 minutes through some stunning scenery of small towns, cedar forests, rural outlooks and the river. 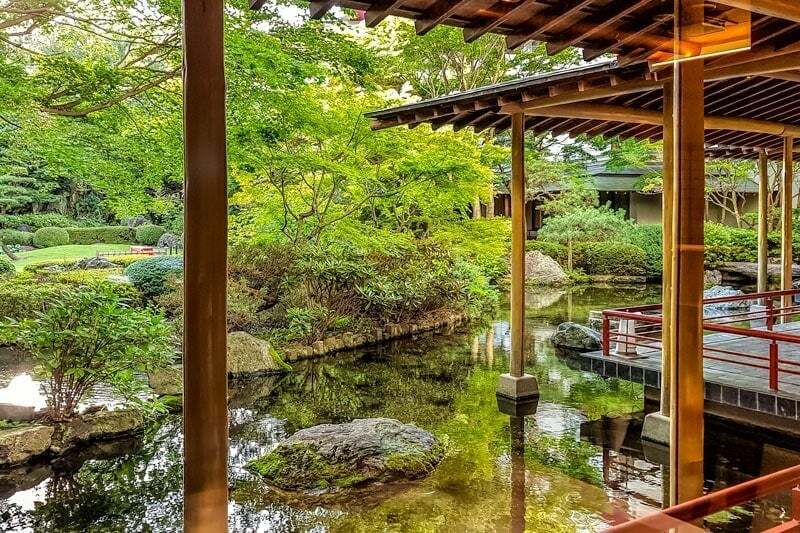 An onsen ryokan is a Japanese experience that many visitors would enjoy on their Japan itinerary but it can sometimes seem an expensive option. 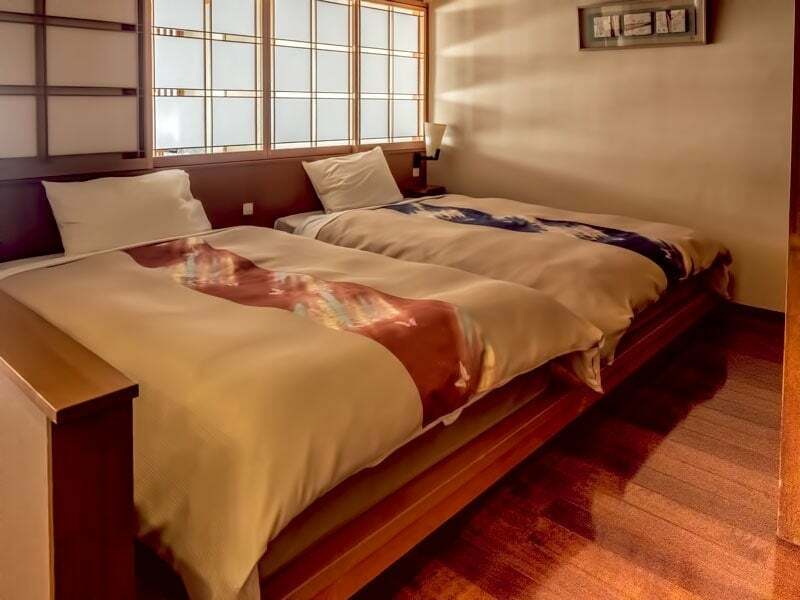 If you’re someone who looks on your accommodation as a base to sleep and shower, you check in late and are up and out with the dawn then the ryokan is probably not the ideal option. If instead you consider it almost a destination on it’s own, the local equivalent of a resort holiday, you’re likely to have a truly memorable experience. An onsen ryokan will often include breakfast and the evening meal, or at least have them as an option for your stay. They will also have hot springs within the property that you can generally use as many times as you want during your stay although those with only private baths will require booking. It’s acceptable to use the baths at any time but before dinner, after dinner and when you wake are all common and really personal preference, if it suits you, do them all. 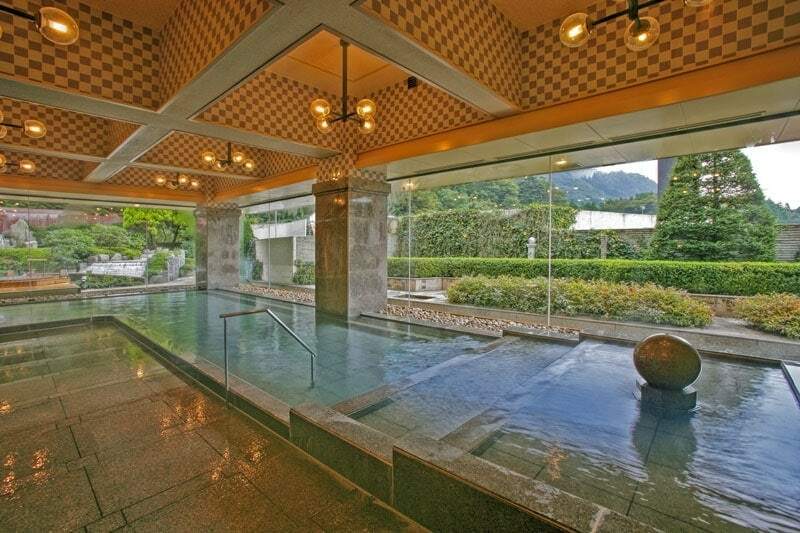 One of the beautiful onsen at Kinugawa Grand Hotel. Photo credit Kinugawa Grand Hotel and Tobu Railways. When you arrive at your room there will be a genkan inside the door. This is a small area to remove your shoes, it’s generally very obvious being lower than the rest of the floor and with a different finish for easy cleaning. Take your shoes off, step onto the interior area in your socks or use the slippers then place your shoes in the cupboard or rack. 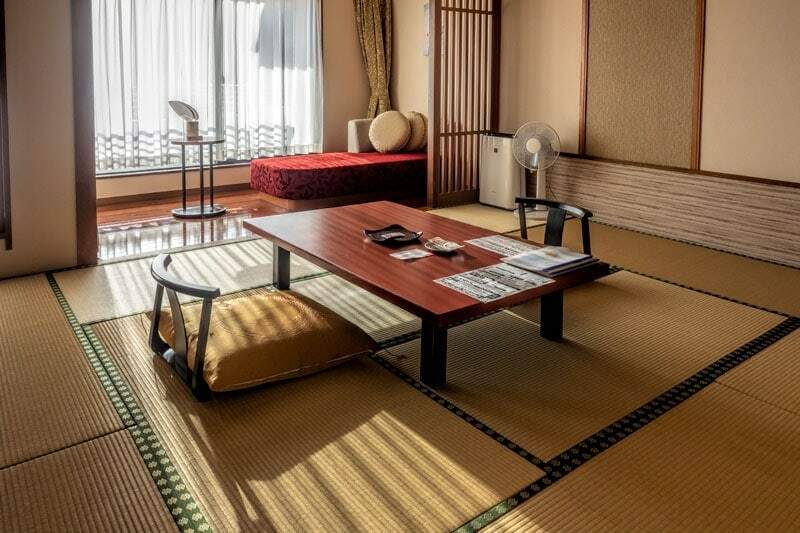 A ryokan will also provide a yakata for your use while you’re there. In a ryokan they’re designed to be worn around the resort, down to the onsen and for meals if you want to. These are different to the yakata provided in a normal hotel which are more like pajamas or lounging wear for use only in your hotel room. There will also be socks and shoes to wear with them. In colder seasons there will also usually be a jacket that goes over it. In a few onsen towns in Japan the hotel yakata are worn out into the town and act as a sort of ‘ticket’ to the public onsen who know what hotel you’ve come from by what you’re wearing. 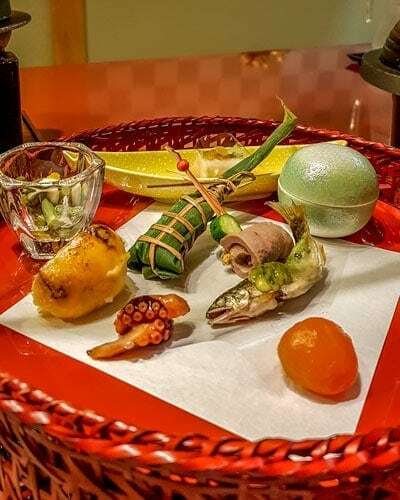 Meals in a ryokan are usually elaborate, multi-course events. Dinner can be the highlight of a stay, especially for the foodies among us and often breakfast is as much a work of art and delicious as dinner. On arriving at the Kinugawa Grand Hotel we were greeted at the vehicle and our bags taken care of while check-in was arranged. The lobby and lounge area were similar to any good quality international hotel but the view of the Japanese garden from the lounge chairs where we sat with a cold drink on arrival were something special. We were then taken to our rooms where a few key items were pointed out such as the location of the yakata and the tea setting. The room was Western – Japanese room which means that there’s a tatami matted room for relaxing but the beds were western mattresses set on a low platform in a separate sleeping area rather than the more traditional futons that are unrolled and set up on the tatami matted area in the evening. As is typical in Japan the mattress was very firm which I find super comfortable and again had a great nights sleep. With tea cups and sweets already laid out and a tea urn holding water at the perfect temperature the first stop had to be a cup of green tea at the low table in the sitting room. While the low seats on tatami matting are actually quite comfortable the day bed by the window was the ultimate; the perfect balance of firm, supportive and cushioned. I sat at it to work on my laptop for a while later in the evening and the next morning and now I really want one of those at home. The bathroom area is sectioned into 3 separate rooms. You enter into an area with the sink and a good sized vanity then there is one door to the toilet room and another into the wet room. The wet room had both shower and bath, it can seem strange initially that you just turn on the shower in the middle of the room and everything gets wet but it’s common in Japanese homes and apartments to have it set up this way and it’s quite a luxury having all that space. Good quality toiletries were provided throughout including Shiseido face products. The one thing that did seem unusual was that there were no towels at all in the bathroom, the only towels are the ones for the onsen which were stored in the bedroom cupboard. The expectation is using the paper tissues in the bathroom to dry hands and face and the onsen towels for the shower. There were 2 towels so that worked out fine but as onsen have a unique scent that lingers on your skin I do like to keep a different towel to shower in the room. 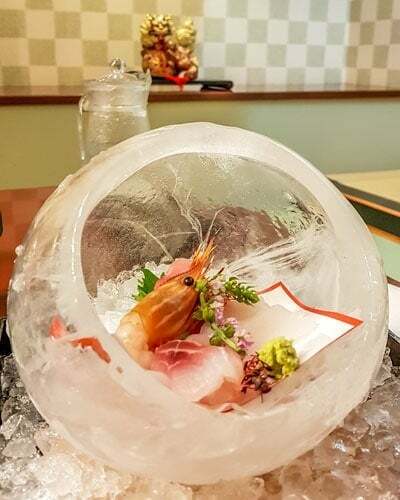 The team at Kinugawa Grand Hotel are incredible and those in the restaurants and kitchens especially so. 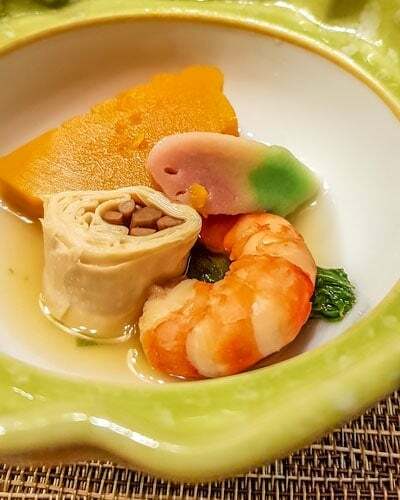 We enjoyed a traditional Japanese multi course meal here known as ryori kaiseki and it was truly incredible. We were in a private dining room with seating on cushions around a low table. However it was made very comfortable as there’s a foot well under the table giving you the option to sit as you would at a western table if you want to. There were so many dishes and each one as artfully prepared and plated as the last. The onsen pools are beautiful here and open almost 24 hours a day, only closing for 30 minutes twice a day for cleaning. After cleaning the men’s and women’s facilities and pools swap over so you have the opportunity in the course of a day to try out all the pools. 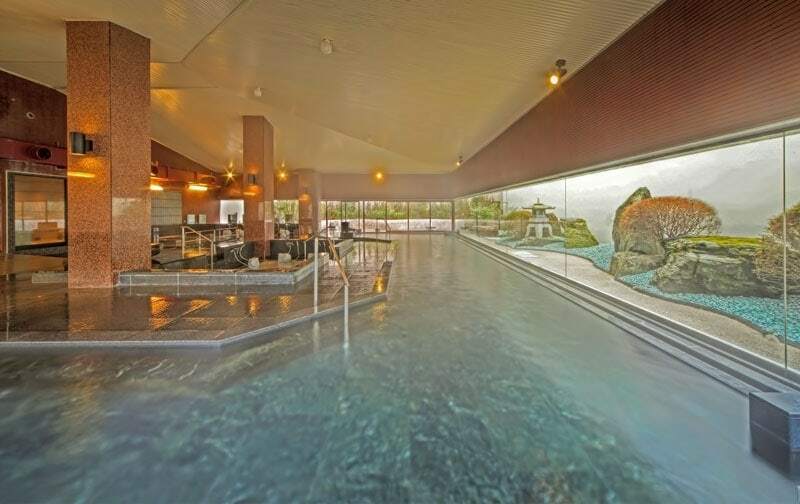 Each section has a large indoor pool with a view out through glass windows to the garden and a smaller outdoor pool which has a slightly cooler temperature, at least it had in summer. I believe pools fed by natural springs such as these have their temperature regulated by the addition of cold water so it may be adjusted by season. The resort also has 5 private well appointed onsen rooms that may be hired by couples or families wishing to bathe together. Konyoku, or onsen for mixed bathing are traditional but now very rare in Japan so hiring a private room is the only time couples will bath together. Overall I loved our stay at Kinugawa Grand Hotel and only wished we could have stayed another night to try out all the other hot spring pools. It’s a ryokan I will definitely make the effort to return to when we have the chance. Relax in nature. 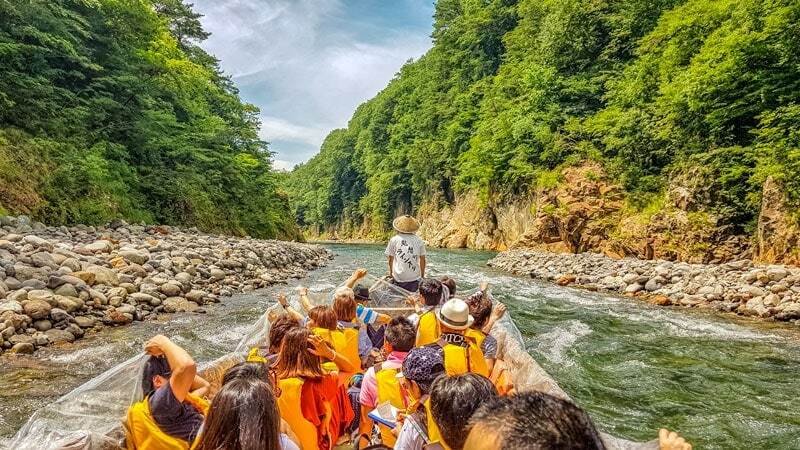 It’s not that there aren’t plenty of things to do during your stay but Kinugawa Onsen is set in a forested gorge on the banks of the pristine Kinugawa River. 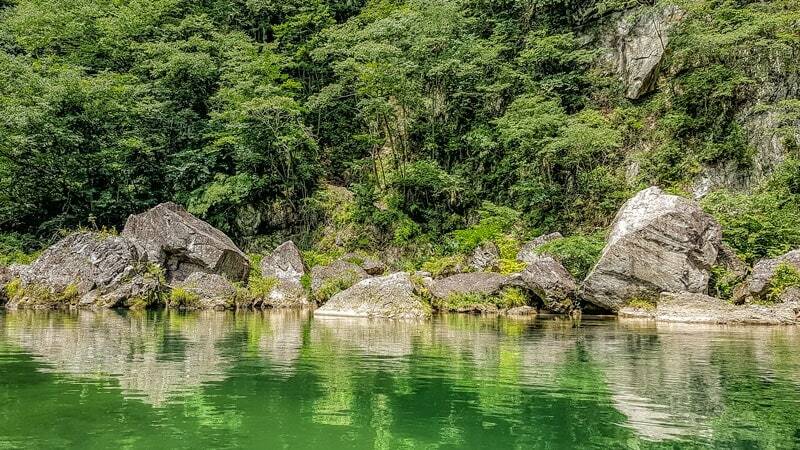 There are mountains in front of you and behind you, fabulous natural onsen a flowing river and everything you need for a soothing break in nature. Feeling like seeing the area from another perspective? A wasen is a traditional Japanese wooden boat and you can take a trip down the Kinugawa river in one. The ride includes several sections of rolling water and depending on the recent rainfall the trip may be a little more or less adventurous. Be prepared for a couple of splashes but we had our camera gear with us and it was in no danger of a drenching. Although the commentary is only in Japanese, it sounded quite the comedy act by the laughs around us that the language barrier shouldn’t put you off going. It’s easy enough to organise your ticket at the office in the English. There are lockers here if you’re catching the shuttle back and want to leave any gear behind and you’ll then be fitted with a buoyancy vest. Once you’ve climbed down the stairs grab a plastic bag and take a seat in the shady waiting area. You stay dry boarding the boat from the river bank into the back of the boat where you remove your shoes and place them in the plastic bag before being directed forward to your seat. Generally you’ll sit on the bottom of the boat with legs crossed by if that’s not possible, or it’s particularly full, there are wooden plank seats that will be fitted. Between the hot spring resorts of Kinugawa Onsen and Kawaji Onsen you’ll find the Kinugawa Ryuokyo Valley hiking trails. Take the train to Ryuokyo Station and it’s a short walk to the start of the track. The trail is 7 km long and suited to those of average fitness who want to enjoy the mountain backdrop, cascades, waterfalls and interesting rock formations along the way. In spring and summer everywhere is vibrant green, in autumn you can enjoy the jewel colored leaves in late October and early November. During the day exploring the UNESCO World Heritage area of Nikko is a great option. It’s 35 minutes on the train to Tobu-Nikko station and the return trip and buses within the area are included in the Nikko All Area pass. 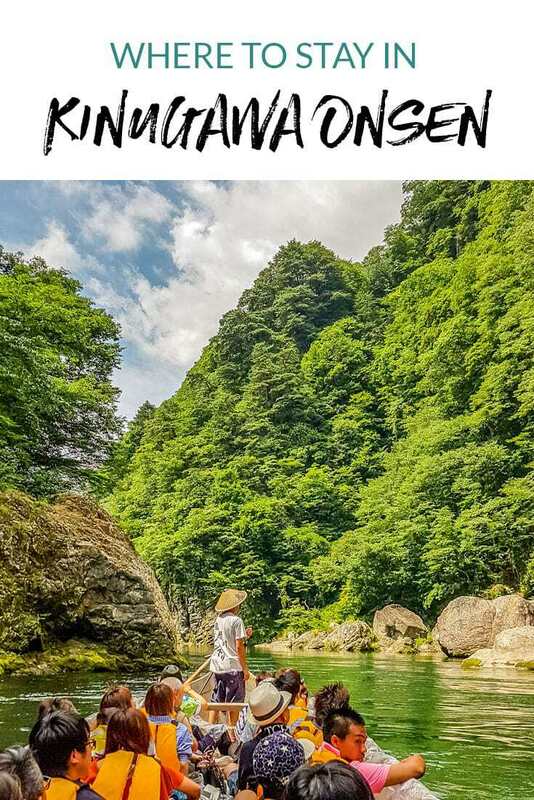 Planning a trip to Kinugawa Onsen? Read our comprehensive guide to things to do in Nikko before you go. A big part of the attraction in visiting Kinugawa Onsen is the ryokan experience and the ritual of relaxation associated with the onsen. 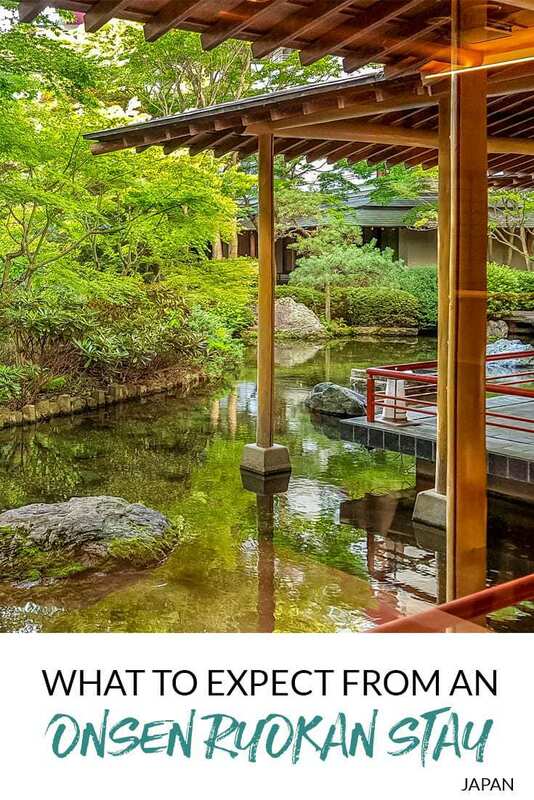 Sometimes however there just isn’t time in the itinerary, the accommodation is already booked in Tokyo or a host of other reasons why it doesn’t work but you still really want to see the area and try out the Japanese hot springs you’ve heard so much about. If this is the case you can make a day trip and visit the onsen as a day guest as we did at Yuryo Onsen in Hakone. It can still be a great experience and if you’re anything like us it’ll prompt you on to find ways to include onsen more often in future trips. Kinugawa Koen Iwaburo is a public onsen in the Kinugawa Koen Park with both indoor and outdoor pools. Entry is Y510 for an adult. Like most of Japan, Kinugawa Onsen enjoys a temperate climate so your experience will vary depending on the time of year that you plan visit. April is the season of cherry blossoms in Japan and Kinugawa onsen is no exception. See the sakura along the river from the river boats and enjoy the night cherry blossom festival. The blooms are followed by the green buds bursting and the hillside coming alive with brilliant green. Summer rains make the river flow and the surrounding mountains are fresh and green. It’s a great time to enjoy the river boats and nature trails. Nikko is renowned for the koyo, or autumn leaves season so this is an optimal time to go. The colour around the river and surrounding hillside is spectacular. The leaves colour up a little earlier up here than in Tokyo so it’s an opportunity to see the change of season if it works better for your itinerary. There’s snow on the ground in Kinugawa Onsen during winter and you can enjoy the unique experience of soaking in the steaming onsen while the snow settles on the ground around you. Most of the outdoor activities are closed for the winter season and expect transport schedules and opening hours at attractions to be reduced. Disclosure: My summer 2018 visit to Nikko was hosted by Tobu Group.